As most of you know, I wrote my Fowlis Westerby novel in 2008 as part of NaNoWriMo. Since then it has undergone various revisions and while I’ve been putting various Fowlis stories on this blog, I haven’t done much with it. And you know what? I feel bad about it. Fowlis is probably my “oldest” character (in terms of time I’ve had him, not age) and I’m not giving him the attention he deserves. I think I’ve been trying to take a step back from all things paranormal which is, quite frankly, daft since my PhD thesis concerns the representation of haunted space in the modern horror film. Besides, I still love a good ghost story. So I’ve vowed to have a workable version of the book by the end of the year! He’s also made his Twitter debut, and you can follow him here. I’m also hoping to have a few more stories to share with you. All speed ahead! 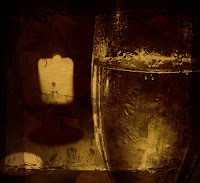 The clink of glasses and low hubbub of voices filled the drawing room. Roddy darted to and fro, proferring the bottle of champagne to the assembled guests. He turned to laugh at the tail end of a joke and saw Gloria by the sideboard, her mouth turned down in a frown. She held an empty glass and glowered at their friends. Roddy sidled across the room towards her. “Why are they all here?” she asked. “It’s New Year’s Eve! After that splendid party at the Glennister’s for Christmas, I simply had to have New Year’s here,” replied Roddy. He smiled and nodded to two passing blondes. He couldn’t remember their names but he knew they’d arrived with Doug. Roddy made a mental note to press for an introduction later. “It’s tasteless, and it’s insensitive. All that loss of life, and we’re swanning around drinking flat champagne!” Gloria glared at him. Roddy turned away from his sister and disappeared into the throng of guests. One of the blondes was waxing lyrical about the marble fireplace and he felt compelled to give her a tour of the whole house. He and the blonde reached the door when he felt a hand on his arm. He turned to see Madeline gripping his sleeve, a gaggle of her fan club clustered behind her. “Roddy, darling, I’ve told all of the girls about your lovely house, and they want to know if we’ll be able to see the ghost?” Her dazzling smile almost blinded him, and the simpering giggles of the fan club made his skin crawl. “Oh but of course! She’s our star attraction. Look, Gloria here will tell you more about it!” Roddy tried to snag his sister’s arm as she stalked past. “But it’s almost midnight.” Madeline held out her pale hand, gesturing to the diamond-studded watch hanging from her wrist. The fan club cooed their appreciation, and even the anonymous blonde at Roddy’s side gasped at the sight of such expense. “Ah yes, Roddy, I do recall hearing your father talking about a ghost or some such nonsense. Care to enlighten us?” Doug appeared behind the fan club, his champagne glass in one hand, and the second blonde in the other. “The house has a ghost?” The exclamation rippled through the guests as an approving murmur, and all eyes turned towards Roddy. He groaned, and threw open the door. “Yes, it does, but to truly appreciate the story, we need to gather in the hall. Come along, this shan’t take long.” Roddy ushered the blonde into the entrance hall. Gloria slid past and directed guests to gather by the front door, better placed to gaze up at the magnificent staircase. “Is everyone here? Can everyone see the stairs?” Roddy stood in the centre of the grand hall. The guests nodded. “That’s awful!” Madeline’s eyes traced the legendary fall down the staircase. The prophecy prompted an outbreak of speculation among the guests, and feet shifted on the marble floor. Roddy laughed and shook his head. He tried to catch Gloria’s eye, expecting to see a reflection of his own merriment. Instead, she stood transfixed, staring at something on the first floor balcony. Was that whispering he could hear upstairs? The guests quietened with the first strike of the clock. Roddy turned to face the staircase. 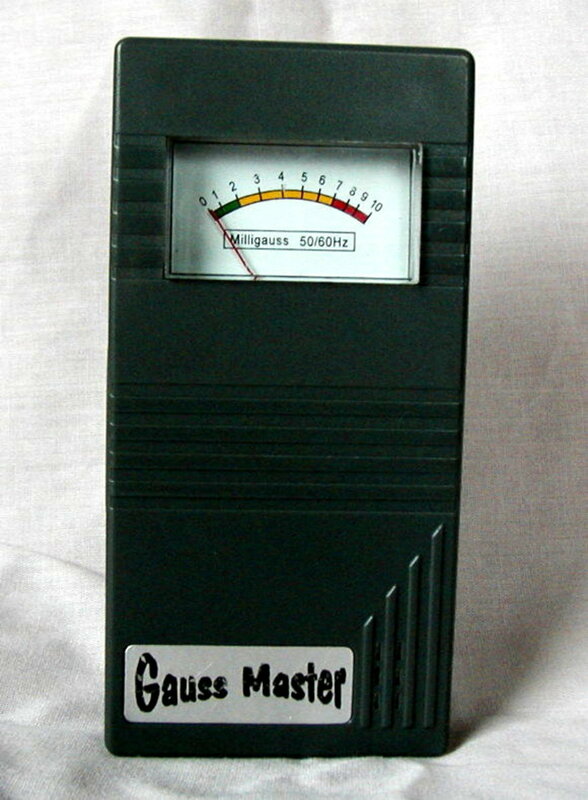 The dark figure appeared on the second strike of the clock. It descended another stair with every chime, its head bowed beneath a heavy mantle, its face in shadow. The figure stopped at the bottom of the stairs as the clock struck midnight. The guests stared, but Roddy glanced upward, convinced he’d seen a flash of white disappear around a corner. The house ghost wore a white nightgown, not a black cloak. He looked back up at the figure. It threw back the hood and tossed the cloak backward in one fluid movement. A translucent Cavalier stood in the entrance hall, plumed hat held aloft in a gloved hand, the other hand extended in greeting. A collective gasp drew a breath of cold air into the hall. The Cavalier vanished from sight before the echo of his booming voice finished reverberating inside the hall. Five minutes passed before any of the guests could raise a glass to the New Year. Fowlis Westerby giggled in an upstairs bedroom with Elspeth Redwing. “That’s the best New Year I’ve had in over eighty years!” Elspeth held her aching sides. Fowlis doffed his hat, and bowed. Happy New Year from myself and Fowlis Westerby! As you can imagine, Halloween is a somewhat busy time of year for me and my kind, and HQ gets rather hectic as we ready ourselves for the Big Day. It is with some gratitude that I say we have the privilege to be never understaffed. Unlike Father Christmas, who endeavours to reach all children on a single night by himself, we have plenty of Haunters to go around! Naturally, we have seen many changes in the festival as the years have rolled by. Why, back in my day, we did not even celebrate Halloween, being as it was the pagan festival of Samhain. (I shall ignore the fact that the Puritan movement wished us to not celebrate anything, let alone Halloween.) What does a Celtic celebration have to do with the demands of small children for sweets? That particular tradition began in days gone by, when it was believed that a soul’s transition to the afterlife was eased by the number of prayers offered by the living. I have never been able to square this belief with the widespread fear of, and belief in, the supernatural, but I do not make the rules, I simply observe them. But I digress. The wealthy, believing themselves to be too busy to offer endless prayers of supplication to the Almighty, needed someone to do it on their behalf. The poor, never ones to miss a trick, stepped in to offer these prayers for the deceased loved ones, in exchange for small biscuits known as soul cakes. I am unsure as to whether or not any poor ones denied their soul cakes chose to toilet paper the houses of the wealthy, but we may leave this matter to speculation. Thus it was that the festival, and the celebration thereof, has continued to evolve, and nowadays, you are more likely to be visited by children dressed as their favourite pop culture characters, on the trail of E-numbers and sugar, but I want you all to remember that while you may not be able to see them, you may find your home playing host to visitors of a more spectral nature. 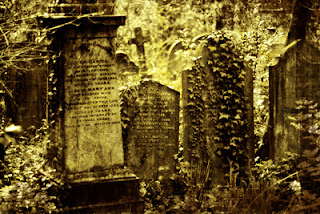 Ancestors, enemies, even old neighbours may come knocking this evening, and their “tricks” are likely to be of a more supernatural nature than flaming bags of dog business or fake vomit pushed through your letterbox. So remember, good people. You never know who might pay a visit tonight, so make sure the house is tidy and you have sweets to hand. Even ghosts like the occasional square of chocolate. Ightham Mote is a picturesque country manor house near Sevenoaks in Kent, but as with many of these old houses, looks can be deceiving. Ightham Mote was built in 1340, and was home to the Selby family from the late 16th Century to the middle of the 19th Century. Over the years, it has had many owners, ranging from medieval knights to Tudor courtiers and high-society Victorians. Ightham Mote was given to the National Trust in 1985, and it is now open to the public. It is a Grade I listed building, and considering the way each new owner has added something new, it is believed to be a startling visual history of architectural developments throughout 700 years of British history. So the story goes, in the 1870s, the owners grew tired of an unearthly chill in the tower bedroom. Normal heat couldn’t overcome it, and eventually workmen were hired to investigate. During their work, they uncovered a small space behind the wall panels – the space was occupied by the skeleton of a woman seated in a chair. Who was the woman? She is believed by many to be Dame Dorothy Selby. A diehard Catholic, she’d learned of the Gunpowder Plot to blow up Parliament in 1605. 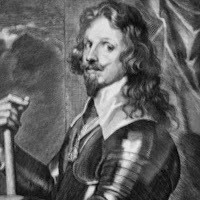 She sent an anonymous letter to her cousin, Lord Monteagle, and told him not to attend Parliament on 5th November. Unfortunately the letter was intercepted, the Plot was thwarted, and the conspirators caught. Dame Dorothy’s intervention was discovered, and friends of the Plot walled her up in a secret room and left her to die. If the story is true, then she remained behind the wall for over 260 years. However, many experts believe this tale to be utter hokum, based on a misinterpretation of her memorial at the local church. After all, records state she died in March 1641 – some 35 years after Guy Fawkes was executed. So if it isn’t Dame Selby, who is it? Another tale dates back to 1552, starring the then occupant, Sir Thomas Browne. Allegedly, he murdered a serving girl and hid the body inside the walls, although if you believe another story, Sir Thomas’ priest was involved in a sordid affair with the servant. After the prist committed suicide, Sir Thomas bricked up the servant. No matter who the poor woman was found within the walls, the chill continues to haunt the tower to this day. The Grey Lady is unlikely to be the only unlucky ghost wandering the halls of Ightham Mote. The crypt is below the water level of the moat, meaning that prisoners kept there could be disposed of by opening a sluice gate. If that wasn’t enough, there was also a trapdoor added during the Wars of the Roses in the floor of a tower room where suspicious visitors would be dropped into a dark hole and left to starve. The room above the main gate is said to be haunted by the ghost of one such visitor. 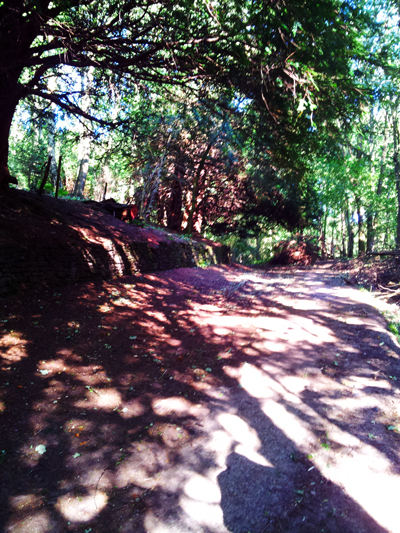 If you’re in the area, Ightham Mote is well worth a visit. You can find out more information on the National Trust website. My first Monday Morning Ghost saw me choose a spectre from my most recent home, in London. This week, I’m coming back to my ancestral home of the North East, and introducing you to the Grey Lady of the Assembly Rooms. In the 18th and 19th centuries, many major cities had assembly rooms to provide an elegant location for their high society to gather and enjoy genteel forms of entertainment, such as balls and concerts. They were one of the few public places to which women could gain admittance, although unmarried women would require a chaperone. The assembly rooms of towns such as Bath were immortalised in the fiction of writers such as Jane Austen, where the buildings also hosted “marriage markets” as rich parents sought to marry off their offspring. Newcastle upon Tyne was no different, and the city’s Assembly Rooms are located in a fabulous Georgian building on Westgate Road. Designed by William Newton, they opened in June 1776, on Midsummer’s night (surely a magical night, if ever there was one). The inscription on its foundation stone, laid in 1774, reads “Rooms dedicated to the most elegant recreation”. Indeed, in the past, the assembly rooms have played host to concerts by Strauss, Liszt and Rachmaninov, and Charles Dickens’ amateur theatre group staged three playlets here. Royal visitors have included Edward VII, George VI, and Elizabeth II. Of course, few buildings of such an age escape having ghost stories, and the Assembly Rooms are no exception. Legend has it that on December 31, 1777, a rowdy group of wealthy patrons were celebrating the New Year. The drink flowed and the behaviour became increasingly bawdy, until one of the young men ordered his wife to dance naked for his boorish friends. This being the eighteenth century, a wife was little more than her husband’s property, and she did as he demanded. Sadly the shame and humiliation was too much for her, and she threw herself from the musician’s gallery in the ballroom. This might sound a little melodramatic to us, but social standing was everything to the upper classes. Staff at the Assembly Rooms have heard the rustle of a taffeta ball gown, and the Grey Lady often announces her presence with the scent of lavender. The double doors open and close on their own, but are too heavy to be blown open by a draft. On Halloween in 2000, a radio crew were terrorised by unexplained noises and knockings while trying to record a special on the haunting. Another group of investigators experienced changes in temperature, balls of light that moved on their own, and electronic equipment that turned itself on and off. Research into the identity of the lady has proved fruitless, and there is no way to substantiate the legend, but it would certainly seem that there is a sad lady haunting such an elegant building. I haven’t really been doing much with my Fowlis blog, which is very remiss of me (and something for which I’ve received more than my share of reproach from the delightful Cavalier) and I’ve decided to start running a weekly feature, looking at British ghosts! After all, I’m working with a paranormal investigations company, and I’m researching the representation of haunted houses for my PhD, so it seems a fun thing to do. Nowadays, there is no crime in the United Kingdom that carries the death penalty, but during the 19th century, it appears that all manner of crimes could be punishable by death. In 1812, a former Bank of England employee named Philip Whitehead was hanged for forgery. That would be bad enough, but his sister Sarah was not informed, presumably to spare her feelings. One day, she arrived at the Bank and asked to speak to her brother, only to be told of his fate by a clerk ignorant of her identity. Sarah didn’t take the news particularly well, and she would visit the Bank every day, asking to see Philip. Sarah always dressed in black, and wore a black veil, earning her the nickname “The Black Nun”. If the clerks turned her away, she would accost customers instead, always asking for her brother. Eventually the Bank officials tired of her behaviour, and in 1818, they paid her to stay away. Reports suggest that she did so for the remainder of her life. When Sarah died in 1840, she was buried in St Christopher-le-Stocks’ churchyard, which later became part of the Bank’s gardens. She was once seen pounding the gravestones with her fist in the churchyard, while she has also been sighted down in Bank underground station. One worker believed he’d spotted an old lady in the station, and given the early hours of the morning thought she’d been locked in, only for her to disappear down a corridor with no exit. Knocking has also been heard inside empty lifts after the station has been closed. Whenever Sarah is seen, she is still dressed in black, and still seeking her brother. 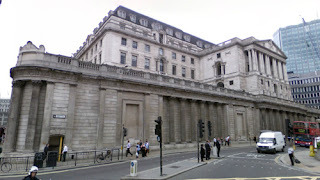 Now, Sarah has occasionally been referred to as the Old Lady of Threadneedle Street, but this in itself is actually incorrect – the title does in fact apply to the Bank itself. The Bank of England has been located on Threadneedle Street since 1734. The street itself has been so named since 1598 – previously, it was part of Broad Street. The Bank was founded in 1694, during the reign of William III, making the Bank the first private national bank in the world.. War with France was draining William’s coffers, and two merchants agreed to found a national bank that could lend money to the Government. This money was to be used to finance the war, while the interest on the loan would be paid using taxes on alcohol and shipping. But how did the Bank get its unusual nickname? In 1797, James Gillray produced a satirical cartoon that portrayed the Bank as an old lady dressed in bank notes and sitting on a chest of gold, while William Pitt the Younger makes unwanted advances. A financial crisis was raging, and gold was not being used to back the issue of paper money. 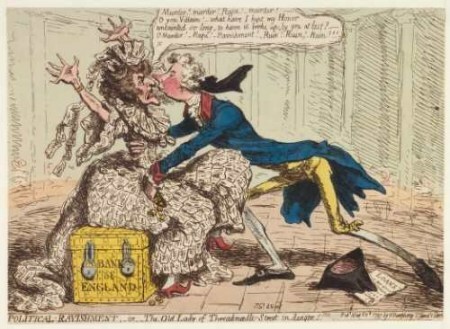 Titled “Political Ravishment, or the Old Lady of Threadneedle-Street in Danger!”, the cartoon is often believed to have been inspired by Richard Sheridan, Member of Parliament and playwright, who referred “to an elderly lady in the City of great credit and long standing who had made a faux pas” and “had unfortunately fallen into bad company”. Such a catchy name obviously stuck. Personally, I prefer to refer to Sarah as the Old Lady. I’ve never seen her myself but if you ever find yourself in the area, and a woman in a black veil stops you to ask after her brother, at least now you know who she is! Mary perched on the step at the back of the room. She hugged her knees to her chest and shivered. Down below, a volunteer historian delivered a talk about 19th century surgery to gawping tourists. The woman paced around the low operating table, her plastic bangles clattering together with every movement. She held up a red block of carbolic soap to make the point that the operating theatre was in use well before an awareness of germ theory. Mary watched the tourists. 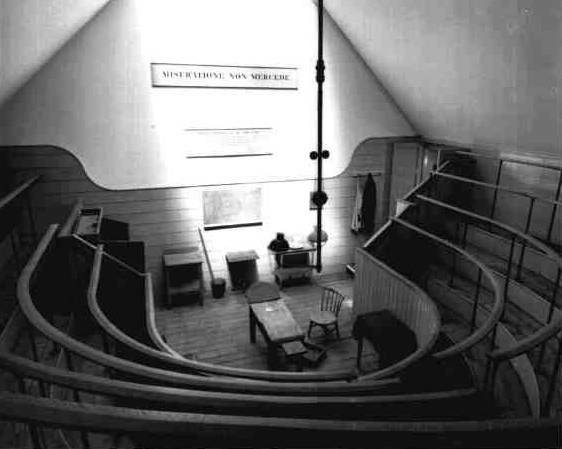 They sat on the high wooden steps where students would have once stood in this miniature amphitheatre of surgical education. Mary wondered at the ghoulish delight humans took in the suffering of others. The tourists gasped when the historian told them of the rivalry which led the surgeons to cut the operating time for a lithotomy to just forty five seconds. The historian called for a volunteer from the audience, preferably a woman. Only women were operated on in this theatre, the men being confined to the other end of the hospital. A young man in a Ramones T-shirt and flip flops ignored the request and put himself forward. He walked down the steps and into the operating area. The historian bade him lie down, and “get comfortable” on the table. Mary grimaced. The operating table was far from comfortable. The historian brought out an amputation case. She held up each of the knives for the audience’s inspection. 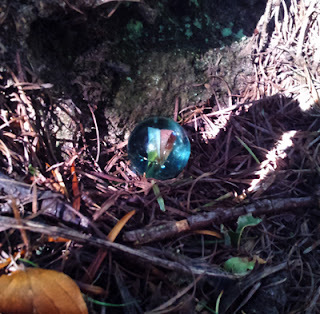 The afternoon sunlight reflected on the blade of the Listen knife, sending a spike of light into Mary’s eyes. She hissed, and scuttled backwards to press her back against the wall. The historian described the amputation procedure, drawing shudders and murmurs from the audience as she used her sleeve to demonstrate the folding back of skin. Mary’s hand explored her left knee, prodding her shin. She remembered the way the bone looked, thrusting out of her skin in an eruption of pus and blood. The doctor gave her the choice of gangrene, followed by death, or amputation, in all likelihood followed by death. She chose the latter, and death returned the lower leg removed in life. Movement to her right caught Mary’s eye. She turned to see a Cavalier making himself comfortable beside her. He flashed a charming smile. Panic fluttered in her chest and she looked around for an escape route. Tourists blocked her way at every turn. The Cavalier laid a gloved hand on her arm and calm settled in her jittering stomach. “Wh-wh-who are you?” she asked. “Fowlis Westerby. At your service, ma’am,” replied the Cavalier. “Assignment? HQ? I don’t know what you’re talking about,” said Mary. She decided the Cavalier had kind eyes, but she didn’t understand him. Mary looked away. She pointed to the back wall behind the operating table. “I know you do, Mary, but there is so much more that you could be doing! You must be ever so miserable, wandering around in the attic or listening to that woman droning on about a procedure you know all too well,” said Fowlis. Mary thought of the hallucinations brought on by the ward fever. She’d seen lots of strange people around her bed that night. She grimaced to think of the red man with horns. “She wanted to take you away from all the suffering, but you wouldn’t go. It was the middle of the cholera epidemic, and she had a lot of people to take that night so she could not stay. She was ever so distraught about having to leave you behind,” said the Cavalier. The Cavalier held out his hand. Mary looked down at the tourists, now applauding the historian for the conclusion of the talk. She turned back to the smiling Cavalier. She placed her pale hand in his. The operating theatre dissolved from view, replaced by a small drawing room. 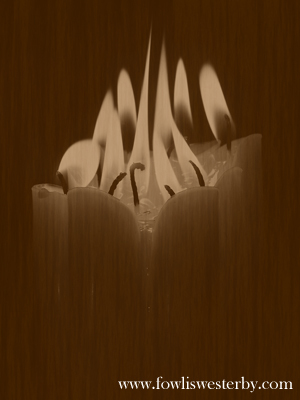 Bookcases lined the wood-panelled walls, and a fire blazed in the hearth. A woman with tousled black hair sat behind a desk. She smiled, revealing grey teeth and black gums. Mary suppressed the urge to shudder. The woman stood up and stretched out a white hand.